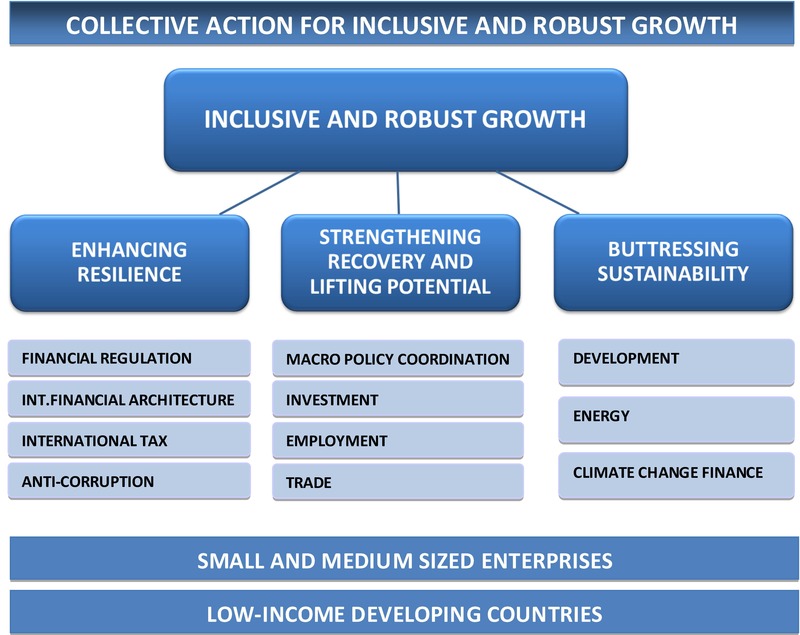 2015 will be a year where G20 will focus its efforts on ensuring inclusive and robust growth through collective action. This can be formulated as the three I's of the Turkish Presidency: Inclusiveness, Implementation, and Investment for Growth. We will build on the legacy of efficient and result-oriented approach in our G20 works, and will always be guided towards concrete deliverables. In 2015 under the Turkish Presidency, we will be building on previous Presidencies' agenda and ensure a seamless continuity in the G20, while introducing new elements to ensure decisive collective action to provide inclusive and robust growth. In addition to that, we will strive to lift the growth potential of our economies. Our major instruments to this end will be boosting the investments, especially closing the infrastructure investment gaps, increasing employment and promoting trade, along with the appropriate macroeconomic policy mix. With that, the focus will be on the implementation of the policies set out in our ambitious growth strategies. We will continue the policy dialogue within the G20 and ensure that our actions complement each other for a strong, sustainable and balanced growth. We will continue analyzing the effects of our policies on each other to understand the positive and negative spillovers, and try to reach at appropriate fiscal and monetary policy mix in addition to the proper implementation of our structural reform agenda. We will be putting much effort to bringing together the reforms that tangibly improve the investment climate and to unlock private sector investments both for infrastructure and SMEs. We will analyze the investment gaps of the countries, especially in infrastructure, with a view to launch country investment strategies to tackle the bottlenecks impeding growth. We will work closely with our partners in the business world to enhance the ownership of these strategies. In this regard, we have asked the International Chamber of Commerce to establish a World SME Forum, building on their extensive international network. This Forum will act as a conduit to voice the expectations and concerns of the SME world to the Business-20 and the governments of the G20. On the demand side, enhancing project preparation, effective project prioritization and developing more efficient Public-Private-Partnership (PPP) models will be our targets. With regard to financial intermediation, Turkish Presidency will attribute great importance to non-traditional sources of lending. Among those we will especially emphasize equity-based financing, with a particular focus on the New Modalities of Asset Based Financing, which is important for infrastructure investment and a good way of diversifying the risks. Creating better quality jobs remains at the heart of G20's shared objective of achieving strong, sustainable and balanced growth. Yet, sluggish global economic growth has been associated with even weaker employment in many G20 countries. Besides, most countries face weaker growth elasticity of employment compared to the pre-crisis averages, further limiting the employment generation capacity of their economies. This trend of persistent unemployment further exacerbates the economic performance of the G20 countries. We will work with international organizations to understand the factors behind the jobless growth phenomenon and also initiate a discussion on the labor income as a share of GDP. To overcome those challenges, we will be monitoring the implementation of our Employment Plans – with a particular emphasis on our ambitious targets to increase participation rates of women and to reduce youth unemployment. Trade is one of the engines of growth and an important channel for generating positive spillovers across economies. Disappointingly, the annual global trade growth rate is significantly lower than the pre-crisis levels. The root causes of this significant phenomenon need to be thoroughly analyzed. Behind this trend, there might be transitionary effects as well as some structural factors, such as the inclination towards protectionism and the challenges that the multilateral trade system faces. plurilateral agreements to have a better understanding of whether, as intended, they complement one another and act as building blocks to the multilateral system. We will also give special importance to the better integration of SMEs, especially in the developing countries, to global value chains as there is a strong correlation between participation in the global value chains and GDP per capita. A healthy and stable financial system, an effective and efficient international financial architecture, a smoothly functioning and fair international tax system; and a fair and level playing field for businesses are essential for the resilience of the global economy. Much has been done to this end, including comprehensive financial regulatory reforms, landmark IMF reform, efforts to make international tax system more transparent and tackling corruption. More work is warranted to entrench the resilience against possible future shocks to the global economy. Core elements of the financial regulatory reform agenda are now close to completion. Building on this, we aim to finalize the new regulatory framework and ensure timely, full and consistent implementation during our Presidency. Furthermore, our work will focus on analyzing regulatory outcomes and effects with a view to drive potential improvement areas and address unintended consequences, if any. emphasis on the ratification of the 2010 IMF Quota and Governance Reform in 2015. In case of a failure, we will start discussions on the alternative ways to enhance the governance of the Fund, with a view to preserve the spirit of the 2010 Reform Package. Strengthening the IMF surveillance in the post-crisis world, addressing concerns related to the stigma associated with the Fund financing, and ensuring adequacy of the global financial safety net will also be within the G20 radar under the purview of the international financial architecture agenda. We will be monitoring the implementation of the 2014 deliverables of the Base Erosion and Profit Shifting (BEPS) Project. We will also work to ensure a smooth transition to the 2015 deliverables of the BEPS project to secure progress in this field. To enhance inclusiveness of the international tax system improvements, we will continue to incorporate the developing country perspective to the G20 tax agenda, with an increased emphasis on bilateral and multilateral cooperation between tax authorities. Fighting corruption is our collective responsibility. During our Presidency, we will closely monitor the effective implementation of the 2015-2016 Anti-Corruption Action Plan. Turkish Presidency will also continue to closely work with the relevant international organizations and give particular importance to the fight against corruption in the public and private sector. As part of our efforts in this area, we will also emphasize transparency in government-business relations, as well. To buttress sustainability in the global economy, we will be focusing on the issues of development, energy and climate change finance. Our central focus will be lifting prosperity across the globe, with a particular focus on supporting efforts to eradicate poverty and ensure sustainable development in LIDCs. 2015 will be a key year for development cooperation as United Nations Summit will be convened in September where post-2015 development agenda is expected to be adopted at by member states and the third International Conference on Financing for Development will be held in July 2015. Turkish Presidency will place development at the center of its G20 agenda. Our primary focus will be on further enhancing the integration of developing and low-income countries into the world economy through concrete and growth-oriented actions. We will place particular focus on improving investment environments and project preparation processes for infrastructure, broadening financial inclusion and contributing to further reductions in the global average cost of transferring remittances as well as assisting developing and low income countries in their efforts to benefit from the international tax agenda through further capacity building. Supporting food security in the developing world will be given particular attention, focusing on sustainable food systems and improving productivity in smallholder farms. Turkey will be the first G20 Presidency to implement the Food Security and Nutrition Framework. G20-led projects and pilots aimed at human resource development will continue. Turkey will also look for innovative ways to enhance the role and contributions of the private sector in development. Today, there are over 1.3 billion people who do not have access to reliable energy. Considering the urgent need to take steps to tackle this global challenge, during our Presidency, we will emphasize the issues of energy access and energy investments. In this context, we will also study the reasons behind the high costs of renewable energy investment, and examine the deployment of public and private resources to fulfill the need for energy investments. Discussions on the G20 Principles on Energy Collaboration and rationalizing and phasing out inefficient fossil fuel subsidies will be continued. We note the importance of "G20 Energy Efficiency Action Plan" and will be monitoring its implementation. We also aim to improve Joint Organisations Data Initiative and follow up the implementation of price reporting agencies principles to improve energy market transparency. Today, climate change is one of the most urgent and the most severe global phenomena that humankind faces. It has no national borders and as a global problem, it requires global solutions. 2015 will be a crucial year for the climate change negotiations as the United Nations Framework Convention on Climate Change is expected to render an agreement that will define the future of our efforts in this important field. During Turkey's Presidency, we will take up this issue with a particular focus on financing aspect and pay special attention to the needs of the LIDCs. We will also conduct studies to improve the collaboration, dialogue and cooperation between the climate funds. The G20 is a unique platform that has the ability to provide impetus to today's critical economic issues. While remaining aware of the responsibility we carry, in 2015, Turkey will attach utmost importance to strong cooperation and effective coordination among the membership. Strengthening the interaction between the G20 and LIDCs will also be an important priority. We will continue to channel the influence of G20 to reach at concrete and beneficial outcomes for the global community. We believe that outreach efforts are particularly important to enhance the legitimacy of the G20 as the premier forum for global economic policy cooperation. Therefore, we will reach out to various stakeholders not only domestically, but also internationally. Our outreach efforts will include countries, international organizations, civil society representatives, trade unions, research centers, and other NGOs. In this regard, Spain, Azerbaijan, Singapore and the chairs of ASEAN, African Union and NEPAD will be invited to the G20 meetings in 2015. G20 engagement groups such as Business-20, Think-20, Civil-20, Labor-20 and Youth-20 also have an important role in conveying us the views of various stakeholders and hence enriching and deepening our discussions. With this in mind, we are going to ensure an effective dialogue with those groups. Our Presidency will kick off on December 1st. The first meeting under the Turkish Presidency will take place at the Deputy Finance Ministers and Central Bank Deputy Governors level and followed by first Sherpas' Meeting in mid-December in Istanbul. Throughout the year, our Finance Ministers and Sherpas will meet four times at various venues. The Leaders' Summit will be held in Antalya on November 15-16, 2015. In addition to the regular meetings of the G20, some other Ministerial meetings will be convened on selected topics throughout the year. This page was last updated December 02, 2014 .